Snack Girl is already making her plans for Earth Day (April 22nd). I am going to celebrate with a picnic! I will eat my kale chips, tofu, chia seeds, and these blueberry muffins OUTSIDE to celebrate the earth. And, I won't use any packaging. Why a picnic? Well, Cascadian Farm Organic sent me a picnic basket with their oats and honey granola in it for Earth Day. I get a lot of stuff from food manufacturers who want me to feature their products. Ahem.......Alex seems to be testing it for our celebration. After we got him out of there, I took a hard look at the granola - and while there were many great things about it (clean ingredient list, whole grains, organic, etc.) - it had too much sugar per serving to pass my healthy cereal test. Inspiration then hit! (or was it Alex's rubber ball?) and I decided to use it in muffins. I call these "Kitchen Sink" muffins because you use everything but the kitchen sink in them. 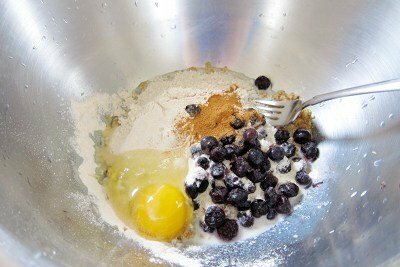 I added Cascadian Farm Organic Granola: Oats and Honey, milk, egg, flour, frozen blueberries (which Cascadian Farm also produces), and cinnamon. These are super FAST to make and I did not add sugar because I figured the granola would already take care of that. And it did! My kids ate one of these each for breakfast this morning and pronounced them GOOD. Hurray! Please LIKE the Cascadian Farm Facebook Page to find more ideas for celebrating Earth Day. Have you mixed cereal into muffins? Please share. Preheat oven to 350 F. Line a muffin tin with foil liners or spray with non-stick spray. Mix ingredients with fork and spoon into six muffin cups. Bake for 20 minutes and enjoy! Wow, those sound great! I may just have to make some, and I never bake! 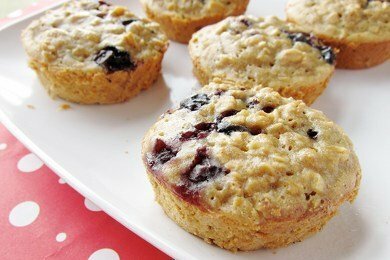 Granola in blueberry muffins? I LOVE it!!!!! Great recipe!! And I mean super great!! That sounds really good. What an interesting texture to get into muffins. I'll have to try that sometime. mmm...sounds yummy! and healthy! I have some home-made granola [made mostly of toasted oats/seeds/nuts/dates/raisins, cranberries with a bit of pure maple syrup] that I think would make an awesome health muffin--thanks for the inspiration! My son is visiting this weekend from Nashville and I've been planning very healthy menus! Can you believe, after all my fanatical preaching, I caught him using Mrs Butterworth on a very unhealthy boxed pancake on Skype the other night--a mother's work is never done-he's 32!! just had to share this with someone who may understand...thanks again for all your great info and ideas! I love blueberry muffins and it's been way to long since I've had one! relatively easy to come up with one that feels like a treat for 2 or 2.5 points. I am excited! I love blueberry muffins. These seem much healthier than the boxed weight watchers ones, for the same points+ value! Thanks for sharing! These sound delicious! Other fruit would work too, I'm assuming? Can't wait to try! These sound great! I love blueberry muffins. That's an easy cheat idea to use the oats mix. Takes out adding a few ingredients (and probably less sugar in the end). Thanks for the recipe. Made these this morning while riding out the typhoon in Sasebo, Japan. My kids LOVED it! I'm sorry, these were the worst muffins I've ever made! I had high hopes with the granola, but they were dense and tasteless :( Oh well.....thanks for sharing anyway. Maybe some will like them. These muffins are OK but would be pretty bland without the blueberries. I used Kashi GoLean Crunch! and I also used whole grain spelt flour because it is more bone friendly than wheat. It has a milder flavor than whole wheat flour. I think I will try making these again but use almond milk and a handleful of toasted slivered almonds (which I get at Trader Joe's so no prep involved) to see if it will improve them. I wouldn't recommend these muffins. It's a waste of some costly ingredients. They didn't have much flavor and too dense. They weren't muffin texture at all. Save your time and ingredients and put the blueberries on your granola with some milk.